"Bad news", a slice through mammary ducts, was made in response to my older sister’s diagnosis of breast cancer. Photo credit: Mark Frey. Guest post by Bonny Brewer. GSA-Art features the creative works of scientists. Read more in GSA President Stan Fields’ call for submissions. If you would like to submit your own work or nominate someone else’s, please send an email to GenesToGenomes@genetics-gsa.org with “GSA-Art” in the subject line. I have been in love with DNA for as long as I can remember. I’ve also been in love with sewing for the same “forever”. 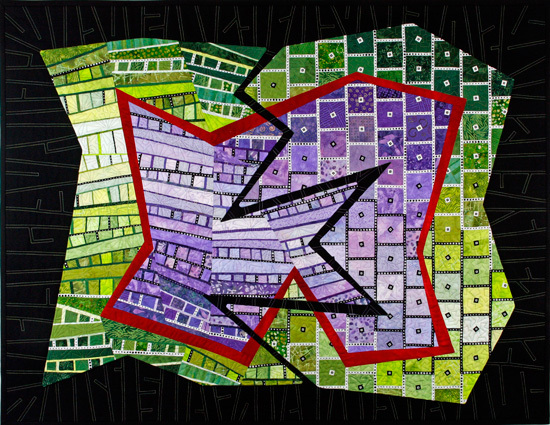 About 20 years ago it finally dawned on me that I could combine the two and satisfy my artistic side by making art quilts with a scientific content. 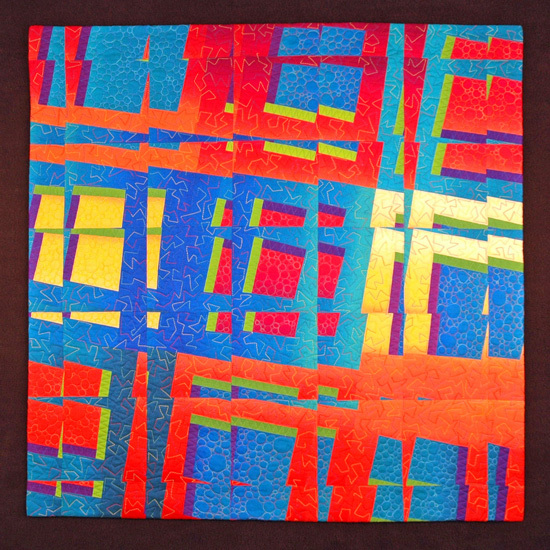 Reflections is created by a technique I developed where four identical quilt tops are constructed, then cut into squares and resewn into a single quilt top. It reflects my love of the square, or perhaps, the Punnett square. Photo credit: Mark Frey. There are quilts for the wall—not for the bed, although I have made those as well. 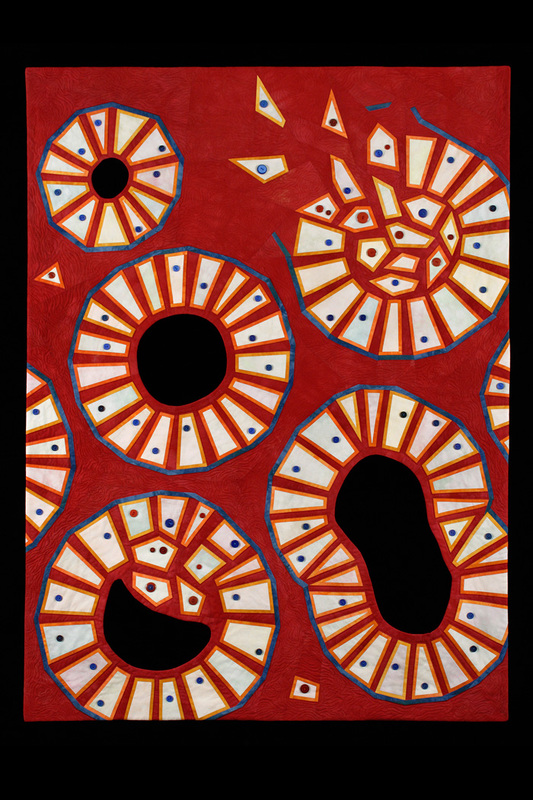 I’ve designed quilts with fanciful images of replicating DNA molecules, gels, chromosomes, pedigrees, tissue sections and yeast cells. There is a limited market for such quilts, so I make them mostly for myself and more recently for students as they graduate from the lab. My two sisters, my mother, aunts and grandmother were/are all quilters. I wonder if there is a gene for that? “Heterodimer” was designed by my younger sister and we worked separately on the two halves of the quilt from a common stash of fabrics (my contribution is on the right). Photo credit: Mark Frey. When I’m not quilting I study DNA replication in yeast. 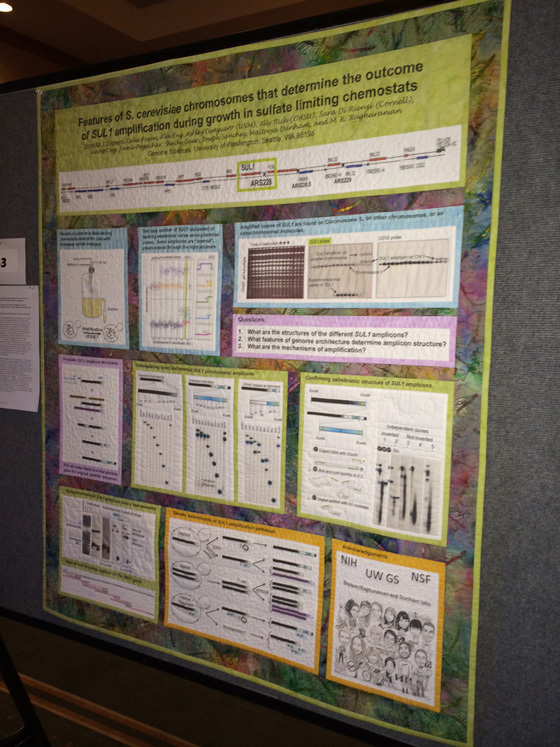 Two years ago, for the FASEB yeast chromosome meeting and the GSA Yeast Genetics Meeting, I made the ultimate art/science fusion by quilting my poster. The GSA needs to start a new poster category award for art posters! About the author: Bonny Brewer is a Professor of Genome Sciences at the University of Washington.